Most Javea Hotels are located close or along the coastline. Finding a really nice hotel should not be a problem. Please consider the big demand especially in the summer months for Javea Hotels, so check availability and do your booking early at your travel agency or via the web. It is always a bit tricky to recommend a specific hotel for us, since we live in the area and obviously do not need to book ourselves into any hotel. What we have come up with, and this works very well so far, is to pass on recommendations from our web site users. Sometimes friends which spent their vacation around the coast line give us a little hint on any good hotel or accommodation. In case of a good and very nice hotel in Javea, the El Rodat Village & Spa in Javea , was the one which came up several times on emails from our web site users. 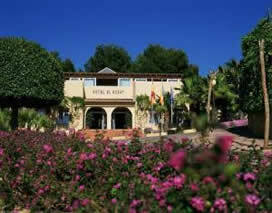 You should have a look at photos and a detailed review of this javea hotel here. It is always a bit tricky to recommend any hotel since expectations and perceptions are different for everybody. In general, please check that the hotel offers a swimming pool, which most do as it is a welcome alternative and decent breakfast buffet. Some Javea hotels offer all-inclusive packages which might be bargain. However the really nice restaurants and pubs especially at Javeas beach are a perfect alternative to any kind of package tourism. A quick guide on the hotels rating system in Spain. Concerning the star-rating of hotels you should be fine with one of the 3-star Javea hotels for basic accommodation. The 4 and 5-star hotels will most of the time offer additional services such as restaurants, swimming pool etc. Please check pricing and availability of Javea Hotels early when you plan a vacation in summer. Make sure you check hotel pricing before and compare it to Javea apartments which are also an alternative. Sometimes (particularly in off-season) you could also check local Javea real estate agents, which rent out apartments of other homeowners. ...share your opinion and write a review about your favourite Javea hotel! I am really sure, our readers whould love to hear about why you liked it so much. It is really easy to do. Just click here and write your story about your favourite hotel in Javea?